Where the Mississippi meets the Gulf: a clearly demarcated interface between the blue, oxygenated waters and the silt-and nutrient-laden Mississippi River. Illinois isn't the only "I" state with nitrates making their way into drinking water and down the Mississippi to the Gulf of Mexico, but their experience can help us understand the problem and the solutions. At Issue #2608 "Nitrates - Part 1"
At Issue #2609 "Nitrates - Part 2"
Don Roseboom of the Geological Survey, University of Illinois Extension Director Doug Gucker, Dan Schaefer of the Illinois Council on Best Management Practices and Warrensburg, Illinois, farmers David and Chase Brown will discuss methods to reduce nitrate levels in waterways. A recent study of farm runoff in Bloomington revealed there was more nitrate content than expected in stream ways. Nitrates result from nutrients like nitrogen that farmers apply to crops. The panelists will look at ways to reduce nitrogen application to farm fields, including alternative farming techniques and the use of cover crops. The GRN advocates for reduction in the size of the Dead Zone through a number of strategies. As states develop limits for how much nitrogen and phosphorus pollution is allowed in water bodies, we are working to ensure that these limits will protect aquatic life and decrease pollution entering the Gulf. Working with activists along the entire Mississippi River, we push for reduction of nitrogen and phosphorus pollution being dumped into the entire river. We monitor and push for enforcement of permits to polluters who are putting nitrogen and phosphorus into the water. We advocate for changes in the way farm subsidies are distributed so that farmers who are demonstrating conservation practices that reduce nitrogen runoff recieve proper funding and taxpayers are not subsidizing pollution. The Task Force includes federal and state agencies (including Bill Northey, Task Force Co-Chair) and the tribes. Federal agencies include those with responsibilities over activities in the Mississippi River and its basin, and in the Gulf of Mexico. The role of the Task Force is to provide executive level direction and support for coordinating the actions of participating organizations working on nutrient management within the Mississippi River/Gulf of Mexico Watershed. The Task Force has designated members of a Coordinating Committee, and solicits information from interested stakeholders. A classic example of why grassroots efforts to address issues like the hypoxic zone are so vital can be found in the article linked below. Politics and action so often do not go hand in hand. 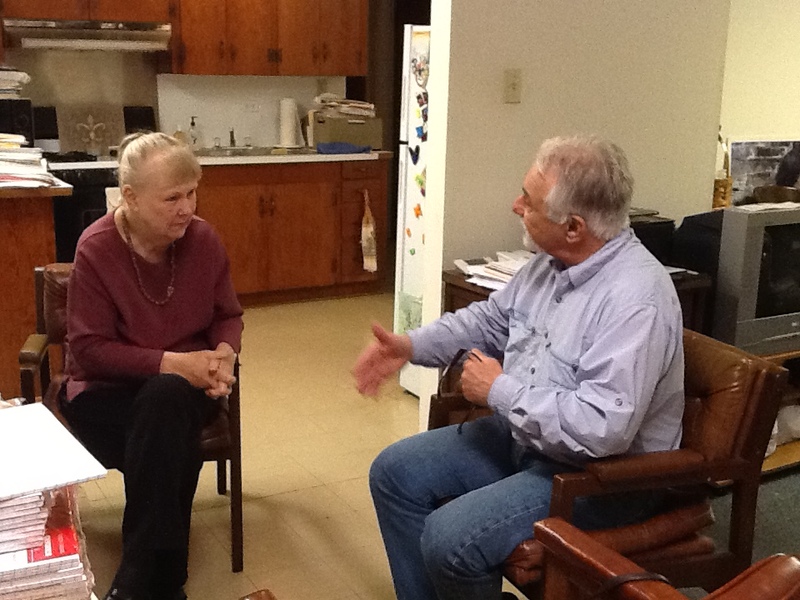 (August 18, 2014) ISU's Professor Cathy Kling and Drs. Eugene Turner and Nancy Rabalais discuss Gulf’s ‘Dead Zone' on New Orleans Public Radio. New Iberia, LA, 1/19/15. Shannon talks to Wilma Subra about what CBCC is promoting to help reduce nutrient flow from Iowa to the Gulf of Mexico. Baton Rouge, LA, 1/19/15. Shannon explains to Dr. Eugene Turner and Dr. Nancy Rabalais some of what is happening in Iowa to address the hypoxic zone. Dr. Nancy Rabalais, is a Marine Ecologist focused on hypoxic zones. She received the MacArthur Fellowship in 2012. When our soils aren't healthy, they can't hold nutrients, which then run off or leach into area waterways, eventually winding up in the Gulf of Mexico, where they lead to the formation of the hypoxic zone, which diminishes habitat, affecting fish reproduction. The vastly agricultural Mississippi drainage sends tons of nutrients down the river each year. ﻿For a better understanding of the Gulf of Mexico's dead (or hypoxic) zone, click the link below. Ceres's Mission: Mobilizing investor and business leadership to build a thriving, sustainable global economy.